Tough times can make for some strange bedfellows, but Peter Truslow says it&apos;s really not that strange that EdgeWater Power Boats is building a performance racing/cruising sailboat. Call it technology transfer. Or diversification. Or exploring new markets. Or keeping his Edgewater, Fla., plant humming in the deepest recession since the Great Depression. Or looking beyond today&apos;s troubles to a brave new world. Call it all of these things, says Truslow, EdgeWater president. It makes sense on a lot of levels. EdgeWater, builder of high-end family/fishing center consoles and express-style powerboats, is building the 35-foot racer/cruiser for Summit Yachts. 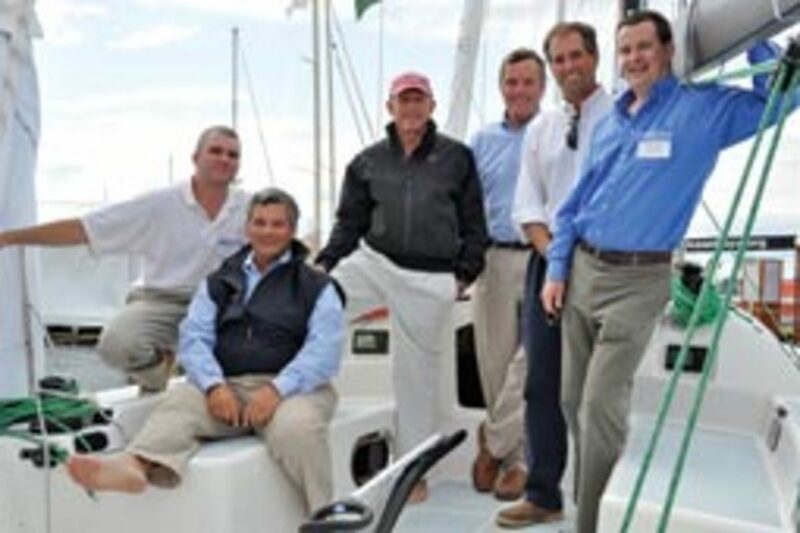 Summit is a partnership between Barry Carroll, whose Carroll Marine Ltd. used to build grand prix racing sailboats, and George Carabetta, an entrepreneur and world-class sailor. "The measure of a boat of this type is its performance, and it appears from early races that this boat is fast," Truslow says, noting the strong performance of two Summit 35s competing at Key West Race Week in mid-January. 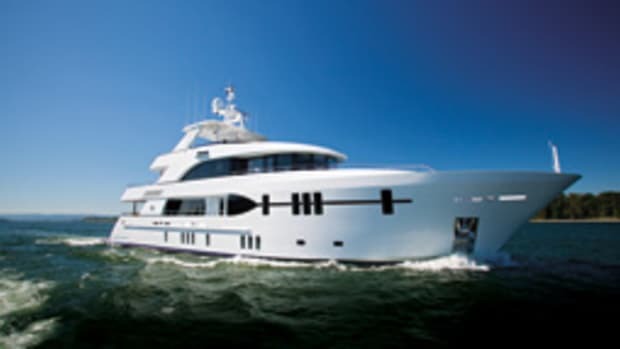 Starting this year, EdgeWater will also build a 40-footer, which Summit was building in Argentina as the King 40. Both yachts are from the drawing board of Irishman Mark Mills, whose Mills Design Ltd. is a leading designer of performance sailboats. Meanwhile, EdgeWater will continue to build the 14- to 38-foot powerboats for which it is known. Truslow says EdgeWater began looking to diversify long before the economy soured. 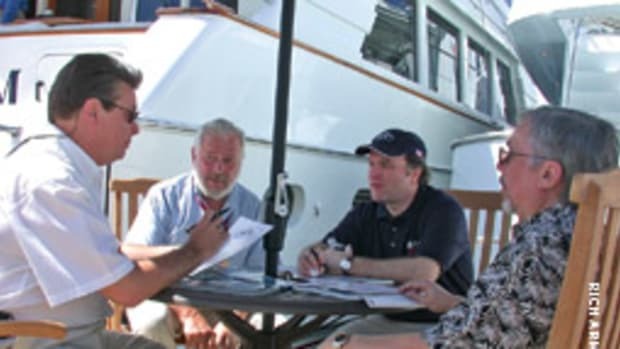 "We were diversifying even before Summit," he says, the company having decided to look into new markets after the terrorist attacks on Sept. 11, 2001, when it appeared as if the terrorist threat might put a permanent dent in recreational boat sales. 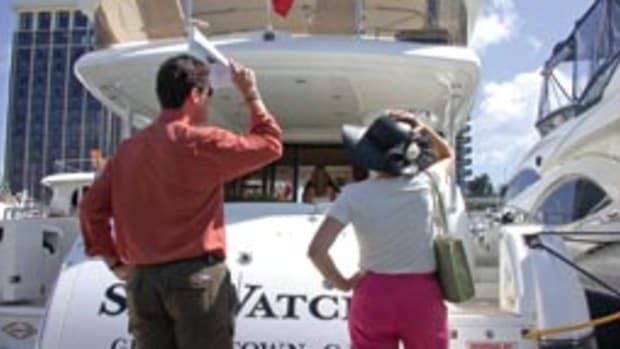 Fortunately, that didn&apos;t happen, but EdgeWater shopped its boats around to other markets anyway and found buyers in marine law enforcement and coastal patrol. "We do a lot of work now for local, state, city and county governments," says Truslow. The National Park Service and National Oceanic and Atmospheric Administration have added EdgeWaters to their fleets, and Truslow has built a dozen 31- and 38-foot coastal patrol boats for Trinidad and Tobago, which used them to protect dignitaries at last April&apos;s Summit of the Americas. Truslow says EdgeWater&apos;s commercial models are a logical extension of its emphasis on semicustom work. 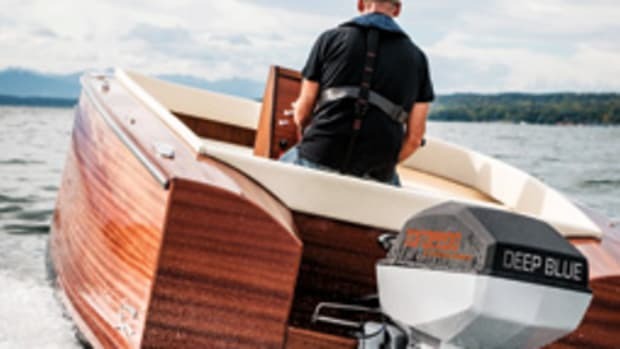 The builder offers semicustom versions of its production models - specially equipped dive boats, yacht tenders and recreational fishing boats - on a "onesy-twosy" basis. "We saw these as opportunities 10 years ago," says Truslow. However, the Summit deal - building a sailboat for an outside company to exacting specifications and developing the production processes to meet those specifications - takes diversification to a new level. Truslow credits EdgeWater&apos;s advanced building techniques with helping win the Summit contract. The company&apos;s semicustom approach to building allows it to cross over from production to semicustom manufacturing runs. It also is experienced in composites - Nida-Core, Airex and Divinycell core, and Penske Xtreme board - and uses a closed-mold, vacuum-assisted process (Single Piece Infusion, or SPI) to infuse vinylester resin into the grid structures and hull laminate in one step. 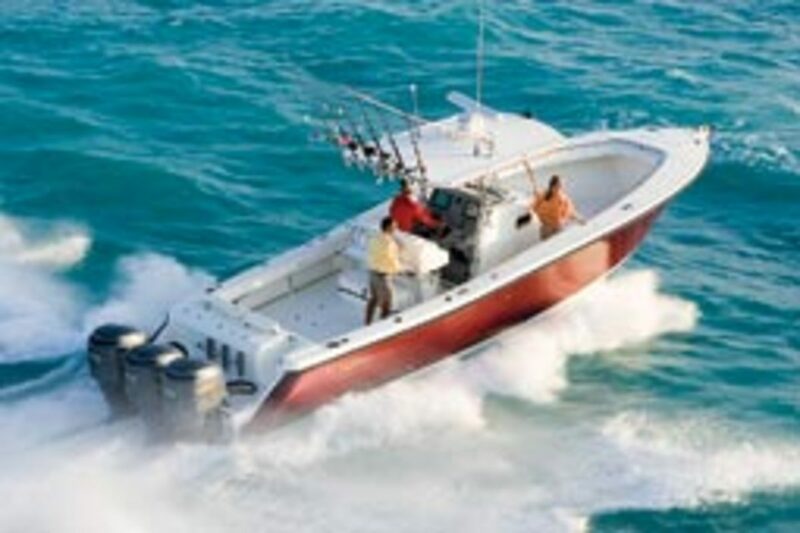 This enables EdgeWater to build hulls that are strong yet light, giving it the versatility to cross over from recreational to commercial and from high-performance powerboat to high-performance sailboat. Truslow says versatility may be the future for a company like his. 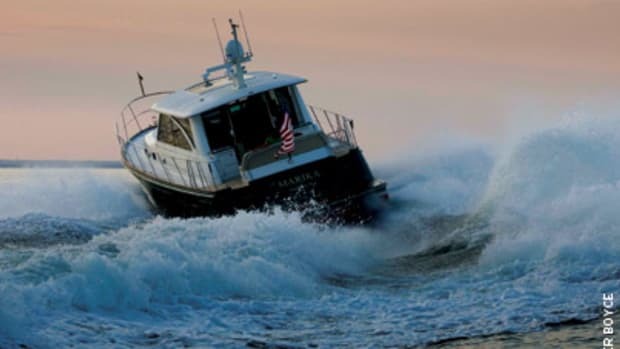 "Our powerboat product business is pretty resilient," he says. "We&apos;re really encouraged by how it&apos;s come back in the last couple of months. For the first time in two years we have a steady stream of orders. It&apos;s not going to come back like it was in the old days. You&apos;re going to need to look at other options, too," both in boatbuilding and other industries. Strong, lightweight fiberglass and carbon fiber composite construction are in demand in the aerospace and wind power generation industries. Truslow also has looked at them as opportunities. "I don&apos;t know where it will lead," he says. But for now, building sailboats is helping him get through the recession. Truslow says his powerboat business is off about 50 percent from 2006-07, and his work force is down from 100 to about 60, which is better than many companies are doing. "We&apos;re actually kind of proud of that," he says. Retooling part of his work force and production operation to build sailboats hasn&apos;t been a slam dunk. Strong and light for racing, Summit hulls are PVC foam-cored with a thin fiberglass skin and a separate glued-in fiberglass cabin liner. Truslow says EdgeWater&apos;s construction experience in close-mold laminates was critical, but building the Summit has not involved a straightforward transference of its SPI technology and manufacturing processes. Veteran builder Carroll came to the EdgeWater plant and helped its sailboat team develop new processes, walked them through their first build, and continues to help them tweak their work. "The guys at EdgeWater did a really outstanding job on the prototype," Carroll says. 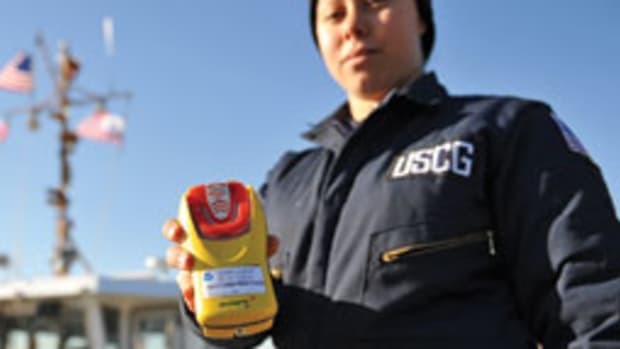 "Every follow-on boat is incrementally better. We&apos;re extremely pleased." 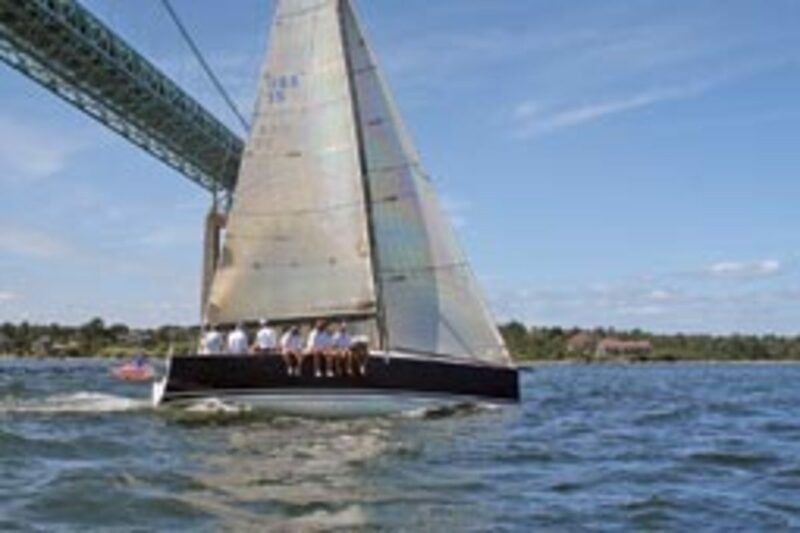 Designer Mills&apos; 40-footer, introduced in 2008 in Europe, has been a winner in its IRC class here and abroad, and the Summit 35 was named best new sailboat last September at the Newport (R.I.) International Boat Show. Summit sold five 35s at Newport, a pleasant surprise. "In this market, I would have said it can&apos;t happen," says Carroll. But sailboat racers are hard-core, and this boat apparently has created a buzz. Carroll&apos;s ties to EdgeWater predate the Summit deal. Carroll has been on EdgeWater&apos;s board of directors for five years. North Marine Group - which owns EdgeWater as well as Southern Spars, North Sails Direct, North Sail Outlet and other companies - asked Carroll to join EdgeWater&apos;s board to help advance its laminate technology and gain an edge in an industry that is being asked to build stronger, safer hulls while saving weight and improving fuel efficiency. The result was the SPI process, adopted four years ago. EdgeWater now uses SPI to build all of its powerboats 22 feet and up. "Where North ties in to this is that North is a high-tech company," says Truslow. It uses three-dimensional computer modeling to develop sails and the latest fabrics for sailcloth. Its spar manufacturer is a leader in carbon-fiber rigging. "They have been very supportive of our efforts to move up the technology scale," he says. Carroll says he had no idea he might one day build a sailboat at EdgeWater, but when it came time to look for a builder he asked if EdgeWater was interested. He knew they could do the job and meet his exacting weight-to-strength specifications. "There was a lot of in-the-shop pride in telling an old sailboat guy how to do it," says Carroll. "I&apos;d ask for eight pounds [in weight savings], and they&apos;d give me nine. That&apos;s good. The quality of the guys that Peter gave us to work with was just great. ... It was a lot of fun." Truslow says the sailboat project has yielded unexpected dividends for the powerboat end of his business. "We figured out a way to make the laminates stronger and lighter [for Summit] and applied it right off to our boats," he says. His designers also are applying it to a Navy project they&apos;re working on to develop a lighter coastal patrol boat. "It&apos;s funny how it all ties together," he says. Carroll says EdgeWater&apos;s workers also have learned something about their capabilities from this project. 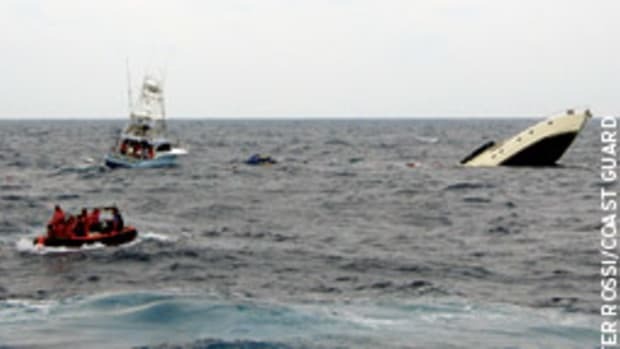 He says its production manager had never stepped aboard a sailboat in the water until he went to the Newport show and boarded the Summit his shop had just finished. "It shows everyone in the organization that they can do more than their powerboat knowledge tells them they can do," Carroll says. "They are builders, not just center-console builders." Knowing that is invaluable." A business has to be flexible and always looking for opportunities, he says. It may not always be building powerboats. 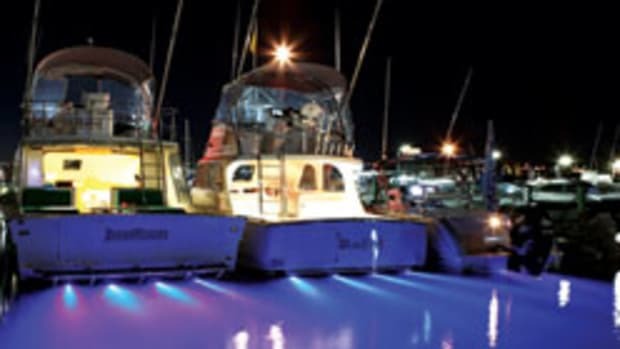 For information, visit www.ewboats.com or www.summit-yachts.com.